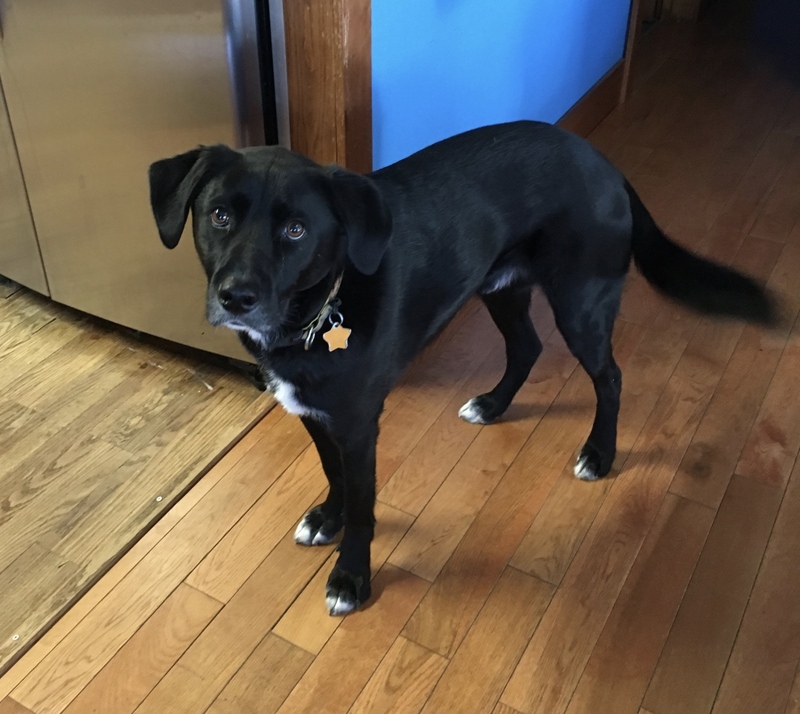 Every day at ten o’clock in the morning, I take Tok—the dog who might make me a dog person—for a walk. We walk through the neighborhood and onto the trails that exist about a block from our house. If I have extra time, we hike with the Happy Hikers an awesome Anchorage hiking group. 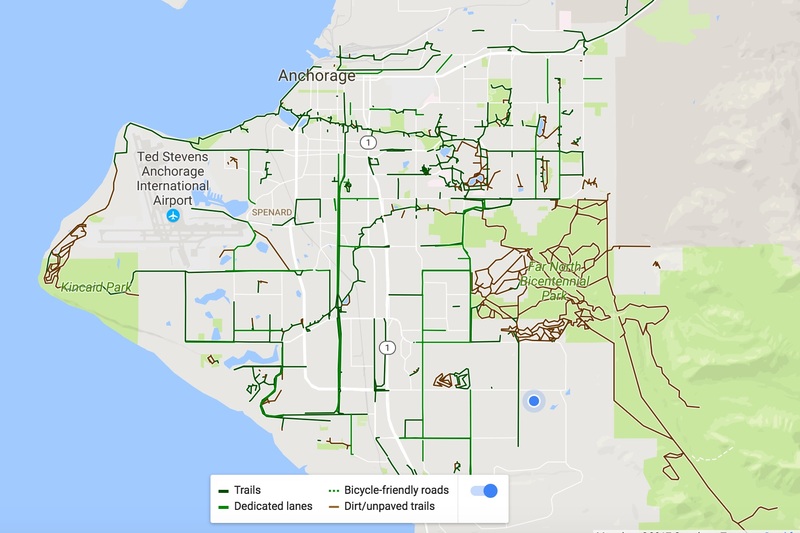 The trail system in Anchorage is internationally known—or should be anyway. It is a serious perk to living here. Not only are there trails in our nearby state and national parks, but there are also trails that wind through the city’s green belts and along its coastline. During the summer, they are multi-use trails. In the winter, some are designated for cross country skiing. My friends and fellow quilters, Beth Nordlund and Petra Wilm both work to keep those trails in great shape. 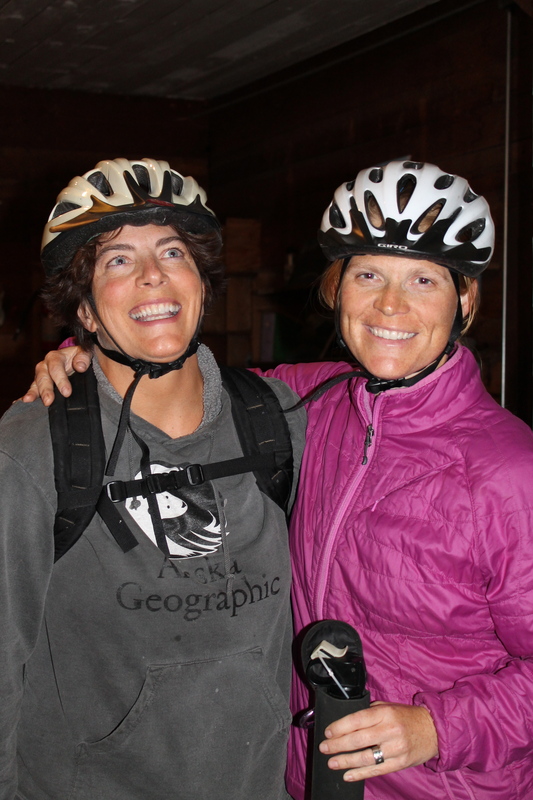 Beth is the Executive Director of the Anchorage Park Foundation and Petra is on their board. Just another example of how great quilters are. If you want to get a sense of how wonderful and important our trails are, take a look at this video. 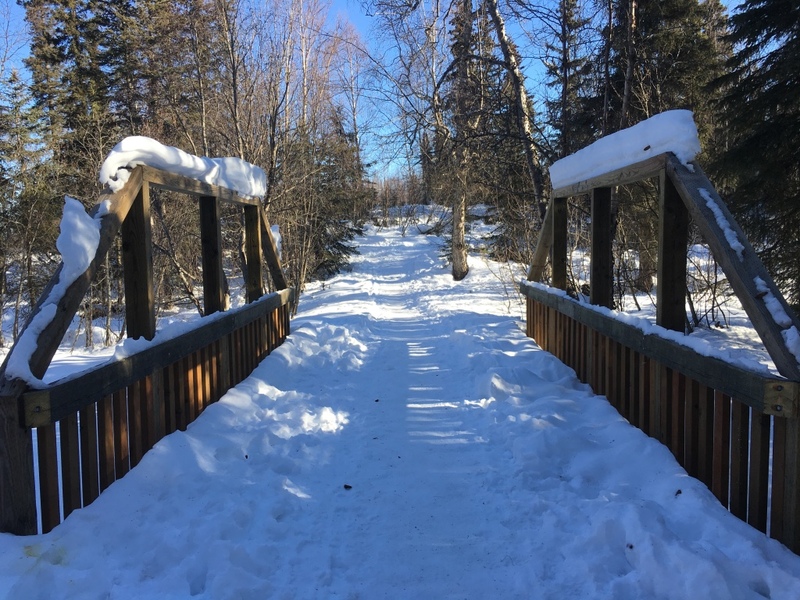 This bridge, on our neighborhood trail, is one of many projects the Anchorage Park Foundation has made happen. Walking in the winter requires some thought and preparation. I don’t really like to walk when it is below zero. One day this winter, I went for walk in what I thought was seven degree weather. I felt incredibly cold. I had misread outdoor digtal thermometer! It was actually negative seven. It was good thing though. Now I walk even when it is below zero. I can do it! 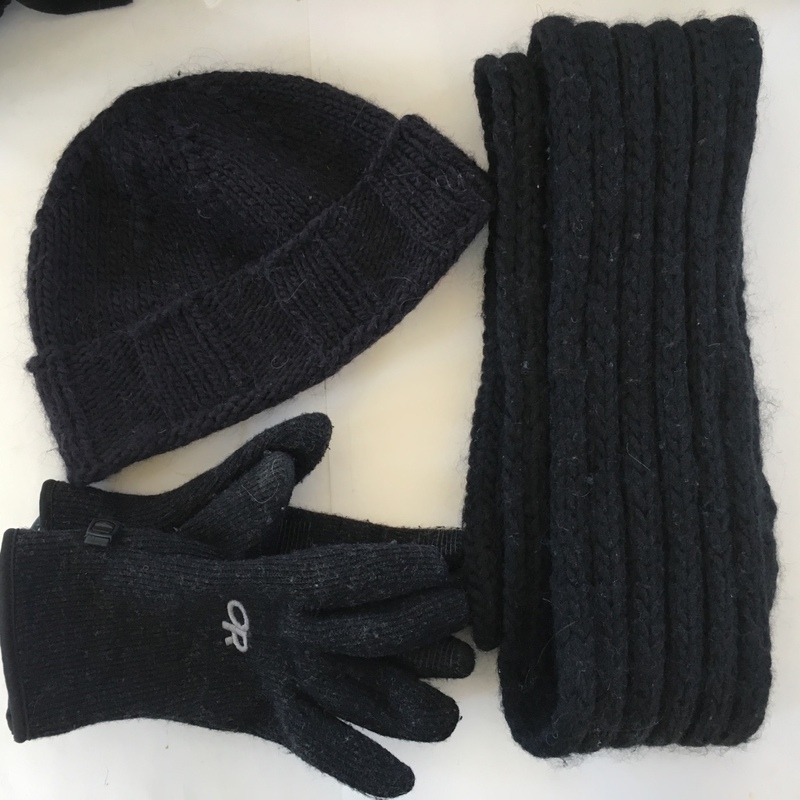 My normal walking attire consists of a wool hat, scarf and gloves. I am very fond of these gloves. They provide maximum warmth with maximum mobility. A wool base layer and then a fleece mid-layer and a parka on top. A wool base layer and hiking pants or snow pants on the bottom. And last, but certainly not least, wool socks, winter hiking boots, and ice cleats. Kahtoola Microspike ice cleats are the best. You put it all together, and it looks like this. The past two winters have been incredibly icy, warm, and snow-less—kind of sad and slippery. This winter was full of glorious snow. Only in the last week have warmer temperatures created real ice to contend with. When it first snows the trail look like this. Weeks later the trail looks like this. And that is where we are at—walking towards winter’s end with my cleats making a crunching sound the entire time. Crunch. Crunch. Crunch. It is March. There is plenty of light and by mid-day it can be 20-30 degrees. I know you southerns think that is chilly, but those temps can feel quite balmy after a long Alaskan winter. I might just wear two layers instead of three. The snow is no longer alpine pretty. Snow conceals, but it also reveals. If there were no snow, we would not know this. This snow’s days are numbered. It’s aged. It’s old. It’s used. Snow can be weather, and it can be weathered. This snow and I have had some good times this winter, but I, for one, am ready to move on. Ready to watch it melt. Trickle down the hillside and disappear. In fact, I think it might just be time to load it up in a dump trucks and haul it away. Tomorrow I will walk again, and it will be warmer, and sunnier, and lighter, and another day closer to spring. 25 Mar	This entry was published on March 25, 2017 at 3:07 PM. 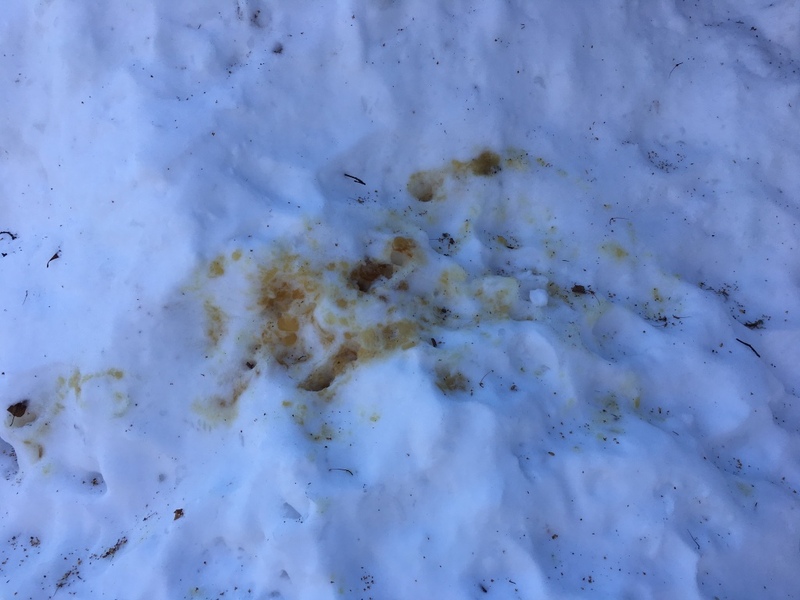 It’s filed under Alaska and tagged Anchorage, snow, Winter Hiking. Bookmark the permalink. Follow any comments here with the RSS feed for this post. You are a brave woman! I have become a bit of a baby when it comes to cold weather. Of course, we haven’t had much cold for the past few years, but even so, if its below 40 degrees, I’m probably not gonna take a walk. I am going to look into those Angora gloves. Thank you for the tip. I think people don’t really understand that dealing with the cold is really about the gear. Modern technology has made dealing with cold weather much more comfortable. So, can a person cross-country ski with a dog? YES. In fact there are beautiful very protected areas for people to ski all over Anchorage. If your dog knows how, you can do it! oooh, I like all of your snow pictures! And I’m envious of all your trails. There are a few here in the City — more than you would think. But it’s nothing compared to that map. Hello there Tok! Who’s a good boy? Look at those white-tipped paws! Carrie- I never thought that trails were that important to quality of life, but they totally are for all ages. Our kids can bike through town without ever getting on the roads. It is a lovely part of living here. Tok might be the best dog ever, and I am cat person! Good to hear from you Carrie. One summer we spent a few days cycling on the wonderful Anchorage trail system. I loved seeing you and your walking attire out enjoying the wintery trails. Marla- I am glad you did that. We take visitors who like to bike out when we can. It is just such a fun way to get around. Right now it is raining, but yesterday here in SC we were out doing yard work in short sleeves! I loved reading about your weather and seeing the photos of all that snow, but it’s not for me! I want to be barefoot in the sunshine! I think growing up in FL spoiled me! Sandy, I am torn when I think about weather. I love and miss the heat so much. But our wilderness is incredible, and we really can get out year round and enjoy it. I hate that feeling of running from the air conditioned car to the air conditioned house. And I hate the cold. In a perfect world, would like to live in both places at certain times of the year. I hope your yard work is coming along. We are melting up here and everyone is getting their starts going for our quick intense summer growing season. I would like to follow your blog, but can’t see how to do so without signing up for WordPress which I don’t want to do. Do you have a suggestion? Janet- If you go to my about page there is a link to sign up for email. Everytime I write a post, you will get an email message and can follw me that way. I am going to email you this info as well with the link included in the email. (I can’t add links here.) I am glad you want to follow the conversation!